This was the Sherlock Holmes reimagining I never knew I wanted and never thought I needed. There are so many adaptations in the last decade that it’s hard to keep track, but this one might be my favorite? Sherry Thomas took the originals and put the most marvelous spin on the characters and their situations. Just a little warning, the beginning of the book took some time to build into the meat of the story, but looking back on it, I think it was worth it to really get an idea of Charlotte Holmes’ background. 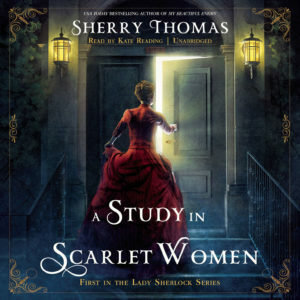 This story still takes place in Victorian England and the Holmes family is part of the upper class and struggling to keep up financial appearances. They’re eager to get all their daughters wed to rich husbands even though some of their daughters have other agendas. This struggle ends with Charlotte as a social pariah, trying to figure out how to earn her own living with no training and no references. Luckily, she falls in with Mrs. Watson and together they form a business around Charlotte’s fictional brother, Sherlock Holmes. Sherlock is always too sick to see his clients personally, but instead chooses to communicate his deductions via Charlotte. With modern eyes, it’s sometimes hard to believe these people are falling for this, but then you think about all the times in history when female genius was attributed to mediocre men and then it’s easy to buy into the premise. The mystery is interesting and complex, but it’s really the characters that shine here. Charlotte is very much still a sheltered young woman, so despite her brilliant mind, she makes youthful mistakes and doesn’t know everything. Mrs. Watson is therefore the perfect companion for her because she has strengths of life experience and business prowess to bring to the table. I just want to spend all my time with these characters, seeing their friendship and business venture grow! Share the post "Say hello to my new obsession"
Yayayayayay! I love these books, and am always thrilled when others do too! I, as well, never thought I needed a female Sherlock Holmes, but turns out I really, really did. For those that have read the next we are in a consensus that it’s even better, so you have something to look forward to? I actually already read the 2nd one IMMEDIATELY after the 1st, I just haven’t written the review yet and no surprise, it was so good! And now I’m one of those people that just wants to constantly tweet the author about when the next is coming out LOL. I bought this book over the summer, and your review is making me super excited to read it! Yassssssss, I’m excited to see what you think about it! Sounds interesting–a bit like “Remington Steele” but with Sherlock Holmes (I think I just dated myself there). You know, I’ve always heard the name Remington Steele but somehow I didn’t know it was a TV series. Reading the premise, it really does seem like that!